Cake pops combine a number of things we all love; a soft cake center, sugary sweet exterior and the convenience of eating it on a stick – just like a lollipop! This tasty treat has also become very popular of late, with many deciding to whip-up a batch of cake pops in place of the more traditional cake or cupcakes. We’ve rounded-up 50 of these fun desserts featuring everything from animals and popular cartoon characters, to savory delights and everything in between. If you’re a fan of LEGO, or your child is, then you’re going to have a field day making these incredible cake pops by 1 Fine Cookie. You can even mix and match your colors to suit your party’s theme! These balloon cake pops by the talented Bakerella almost look too good to eat! They’re also super fun to create, so be sure to check out the full tutorial. Here’s a great cake pop idea to whip-up for Easter, courtesy of Bakerella. Children and adults will both love these delicious, chocolate filled baskets! Fancy a sweet winter treat to beat the icy blues? These delicious hot cocoa cake pops from Bakerella are sure to put a smile on your face! Everyone loves Minions and now you can add a whole lot of fun to any event by creating these cake pops which celebrate the popular characters. Bakerella will show you how it’s done! Who wouldn’t love to dig in to a chocolate fudge brownie cake pop? It’s a combination of everything delicious! Barbara Bakes has this wonderful recipe. What could be better than a table centrepiece? An edible table centrepiece of course! Better Homes & Gardens has this clever (and scrumptious) cake pop tutorial for you. If you’re a fan of the ‘pug life’, then you just can’t go past these adorable pug cake pops from Bakerella. Biting into one of these will definitely be a guilty pleasure! Speaking of dogs, here’s another cool canine design, also from the clever Bakerella. Boo is one of the most famous dogs in the world, so you’ll have a ball recreating him in cake pop form! 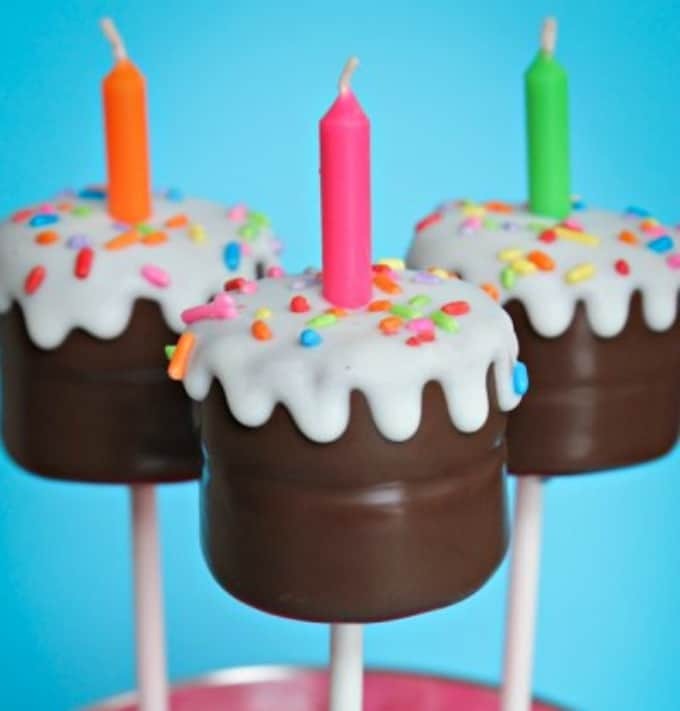 When it comes to awesome cake pop designs, Bakerella is your go-to guide! Here’s another animal creation from her blog, this time featuring everyone’s favorite moody feline – Grumpy Cat! No Halloween party is complete without these fantastic Frankenstein cake pops from Betty Crocker. Not only are they delicious, but they’re also incredibly fun to make. If you’re a newbie to the whole cake pop craze, then you’ll be pleased to hear that this golden snitch themed tutorial from BuzzFeed is for you! It’s easy enough for beginners to create, while expert bakers will love the fun additions like (inedible) feathers. Bakerella has made not just one Muppet, but 5 of these different characters! This is one sure-fire way to get the kids involved in baking too. Here’s another fun Easter treat, this time from Cake Poppin’. You can create these wonderful Easter bunny and bunny booty cake pops by following this step-by-step guide! CandiQuick has a fancy take on your traditional cake pop recipe, incorporating key lime into its unique flavor – delicious! These will look great sitting on the table for your next soiree. Here’s a perfect ‘game day’ treat from Celebrating Everyday Life, featuring these mini football cake pops! The male in your life is certainly going to love these ones. Maple bacon cake pops – is your mouth watering yet? (Because ours certainly are!). This wonderful tutorial comes from the talented Cookie Dough and Oven Mitt. These cake pops from Craft Foxes have been made to look just like popcorn – how clever is that?! These are perfect for a movie night, or even a cinema-themed party. This bear almost looks too cute to bite into, but who can resist a shiny chocolate coating like that? Craftsy’s blog will teach you how to recreate this adorable treat. If you serve these at a party, they’ll be gone before you can say “Oreo cheesecake cake pops”. Diethood has this wonderful (and mouth-watering) recipe. 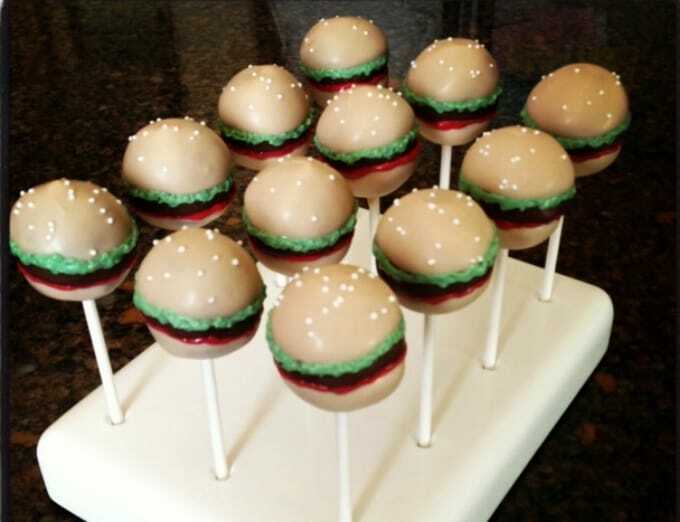 These burger cake pops by Heavenly Cake Pops combine our love of sweet and savory foods to create the ultimate party show-stopper. You’ll love the step-by-step images too! Valentine’s Day is just around the corner and these ‘shot through the heart’ cake pops from Hello Little Home are perfect for celebrating the occasion. Check out the tutorial to see how you can recreate them! Nutella cake pops? Yes please! These delicious treats from How Does She are sure to satisfy every sweet tooth. These red velvet cheesecake pops by Life, Love and Sugar will surprise you with their soft, red center! They’re a wonderful ‘all occasion’ treat that you can easily whip-up in no time. These are awesome ideas! They’re so intricately designed so I don’t think I’d be able to do most of these, but it’d be fun trying!